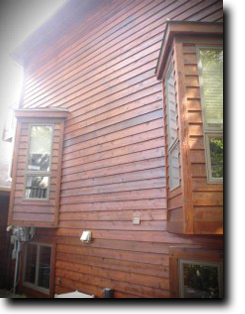 If you want to highlight the natural beauty of cedar siding while providing a high level of durability, Sikkens and structures are the products for you. In order to apply these products properly, a specific set of skills in wood care is required. 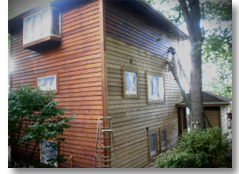 Okeefe Painting, llc has been providing log and cedar siding restoration in Minneapolis and St. Paul since 1997. Our process includes chemical treatment to remove previous sealers and brightening and applying premium products. Sikkens offers many products for exterior finishing. The product that was applied in the picture to the right is Sikkens Log and Cabin. This is a satin sheen translucent stain. Its primary chemical make-up is a high alkyd resin formulation. The sikkens application process is complete in two coats with 24 hours of dry time in between coats. The first coat soaks into the wood and gives it the color of your choice. The second coat is where the real beauty of the product starts to show. What is Structures wood care? Structures wood care was started by a former Sikkens employee. He saw an opening in the market and started developing his own exterior wood stain to compete with Sikkens. One advantage to Structures wood care is the water based 100% Acrylic formula. Because it is a water based stain it has lower VOC (volatile organic compounds). The other benefit is you don’t have to completely remove previous stains that have been applied. The below video is a final walk through of a project we finished in Minneapolis. The process included removing the old stain using our proprietary stripping/cleaning chemicals, brightening and applying two coats of Sikkens log and siding in Cedar Tone. The project turned out beautifully and the customers could not be happier. To get your free quote, call us at 612-298-2244 or fill out our contact form and we’ll call you.